Thank you for all the nice comments on my dress refashion in the previous post. I am so happy to change that one-hit wonder into a wearable dress. Believe me when I say that the finale to this series will not be so wearable! I do love those cotton sateens, however I am going nuts for knits this summer. 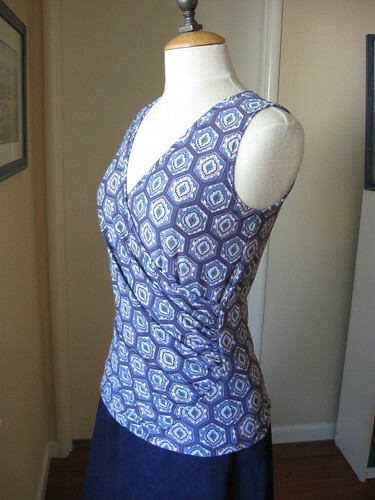 Can I tell you how crazy I am for this pattern which is Simplicity 1916. 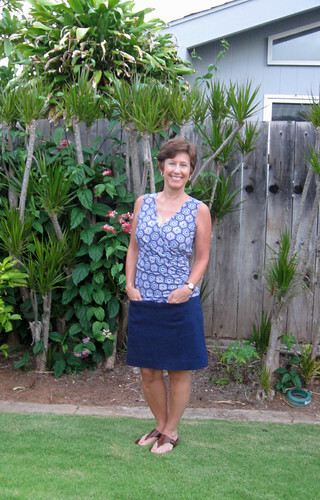 Perfect for vacation wear and maybe this is the right top for my Vogue 1247 skirt. I have another one planned with short sleeves. Fabric is from Joann fabrics, I had enough to make a Jalie scarf-collar top this winter for a friend and then thought it would work for this pattern. I first saw this top on Myra's blog, it looked really great on her so I was intrigued. She made it a couple of times and in her second post included some very helpful tips on adjustments of the front. Cost of fabric x importance of project = stress factor of person holding the scissors. . . math problem for another day. In any case, this top is no stress at all, although I did make a few changes. For the neckline binding the pattern has you stitch it together at the center back and then apply the binding but I found the upper back was way too big on my first version. For this version I stitched the entire top together at the side seams and then stitched the center back seam last which allowed for some tightening of that upper back area. Instructions call for applying the binding and then turning under and stitching so it is concealed. I skipped that second fold, stitched very closely to the seam to hold it in place which served to make it an edge trim plus it raised the neckline about half an inch. I did make a third version for my friend Alice, in a brown rayon jersey knit she purchased from the bargain bin at Happy Stop Fabrics in Oakland. After a few months she came over with a bundle of these knits saying she decided they were not going to be sewn into anything soon. So I was rather pleased with myself to make her a top for her birthday with fabric she provided! Note that she is tall and I added about 3 inches to the length. 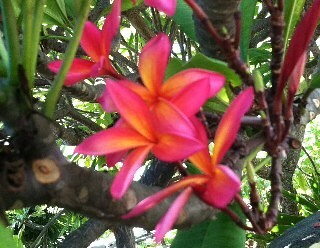 I could not resist this taking this shot of plumeria on a walk this morning, what a color combo. Happy sewing, Beth. Your top certainly look very good with the skirt, and the print is great! The colours on the flowers are beautiful! I made view F from that pattern early this summer. Seeing your version makes me want to pull that pattern out for another go. Thats wonderful on you- a wrap with no gap is a thing of beauty! Your tops are beautiful! I am loving the print fabric. I've also been nuts for knits this summer, so I will for sure put this pattern on my list. I like the idea of sewing up the CB seam last to adjust the fit. I might have been tempted to cut the back on the fold otherwise. The visible binding is a nice look, and I appreciate also that it raises the neckline! The plumeria is gorgeous. I've got white & yellow plumeria in my yard, but they have been short on blooming this year. 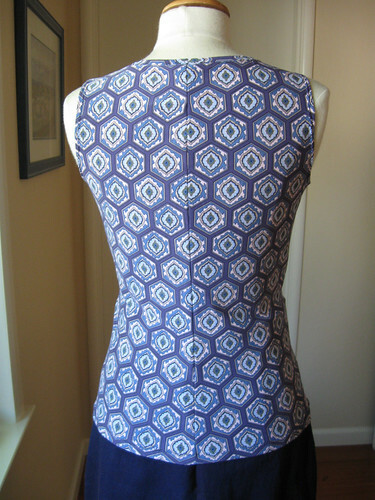 Great tops - your fabric is beautiful and the matching great. This top does look fantastic with the Vogue skirt! That's excellent pattern matching work. I love the plumeria colours too. I'll add this pattern to my 'want' list. Wow Beth, your version is really nice! 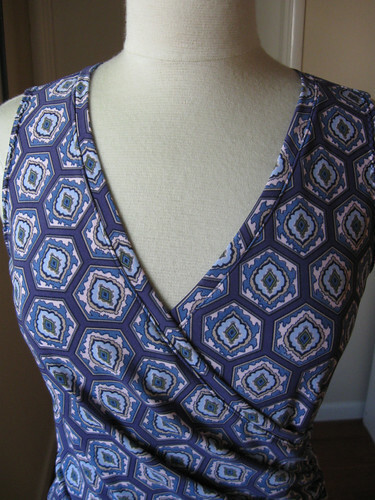 I wouldn't have guessed that the details of this top would show up with a print...you proved me wrong! I love your fabric selection and the great matching of the print! Thinks it's time for a new one for me! I had to alter the back on mine the second time too and for got to add that to my post...I ended up fixing the pattern and making that piece a "place on fold" so there was no seam in the back. Wow! That's really nice!! I have this pattern, AND this fabric! :) I do believe I'm going to cut this out tonight, I don't know that I'll do such a good job of matching though! I made the long sleeve version of the top a couple of months ago, but I haven't worn it because it's been too hot. Thank you for sharing the link to revise the pattern. I bought this pattern earlier in the year but haven't had a chance to work it up into anything just yet. The tops (yours and your friend's) look great! Love your tops. I found your review on Pattern Review, since I'd like to make this one too.